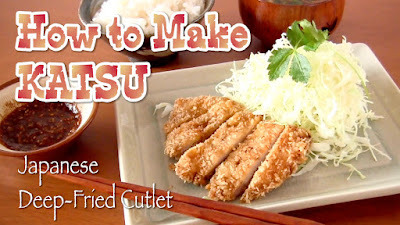 Tonkatsu is a deep-fried pork cutlet. It is a very simple and popular home-cooked meal in Japan. "Ton" means "pork" in Japanese. If you use chicken, it is called "Chicken-Katsu". If you use beef, it is called "Beef-Katsu". 4. Slice each Tonkatsu into small pieces and serve with shredded cabbage. Grind the white sesame seeds and mix into the Tonkatsu sauce. Dip the Tonkatsu into the sauce and eat. You can add some Karashi mustard if you like.